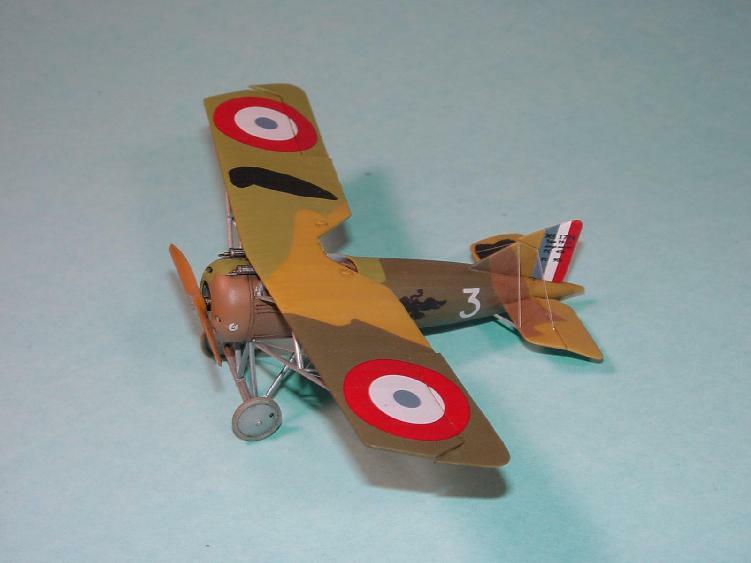 The Type AI was Morane-Saulnier’s (MoS) last attempt at a WW1 aircraft. 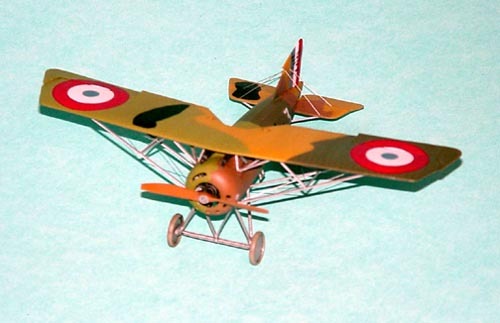 It was developed in conjunction with a typical biplane fighter (the Type AF) but due to the excellent qualities of the Type AI, it was put into production instead of the Type AF. Initially the Type AI passed all structural tests with flying colors – in fact, using these tests as a guideline it was one of the strongest aircraft ever produced. The initial flight of the Type AI left the pilots enthusiastic, and at the time it was thought that the Type AI was the best aircraft flying at that point. 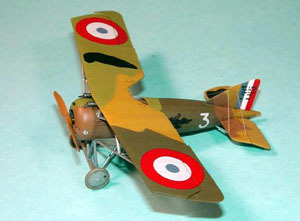 There were three Escadrilles (squadrons) that were converted into the Type AI – MSP 156, MSP 158 and MSP 161. There were three sub-types of the Type AI produced. The MoS designation for the single gunned example was MoS.27.C1, while the type with two Vickers was known as the MoS.29.C1. The trainer version – which used the 120hp LeRhone instead of the Gnome engine found in the fighter version – was designated the MoS.30.E1. Unfortunately it appears that during “normal” combat flying the AI proved to be quite deadly. Due to forces unknown back then (most likely wing flutter) the AI tended to shred it’s wing during combat. However, it appears this only happened a couple of times, but it was enough to convince the French to pull the type from front-line service, and relegate the type to training duties only. Personally I feel it was a shame that Morane-Saulnier was not allowed to correct the errors. According to some of Walter Shaffer’s letters to home, the Type AI was extremely nimble in combat, and could out-perform anything in the sky at that time. The kit consists of approximately 45 resin pieces and a superb decal sheet that covers two aircraft – Rufas Rand’s of MSP 158, and Walter Shaffer’s of MSP 156. However, Sgt. Shaffer’s machine was a MoS.27.C1 – which was a single gun machine – so out of the “bag”, this kit can’t be used to build his machine. Unfortunately photos of MoS.27.C1 machines aren’t prevalent, especially in the area of the forward, upper fuselage, where the gun is. 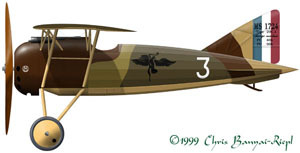 The MoS.29.C1 (and .30) had a “hump” like a Sopwith Camel where the guns were. It appears that MoS.27.C1’s did not have this hump; instead the gun was mounted directly onto the forward, upper fuselage. Unfortunately that’s all conjecture, as I have found no clear pictures showing this area. Naturally construction starts in the cockpit. Everything you need – minus the fuel control, wires and seat belts – are included in the kit. The cockpit is a work of art! In order to get everything lined up onto the floor, I decided to use a piece of balsa and pin the floor to it while gluing on the tubular sides. This worked great, and with the way the kit’s cockpit is designed, alignment is excellent. I added stringers to the sides of the cockpit, even though it is difficult to see some of them once the cockpit is closed. Colors in the cockpit were medium gray for the forward areas, natural wood for the instrument panel and “pilot surround”, and light gray for the metal areas of the tubular structure. 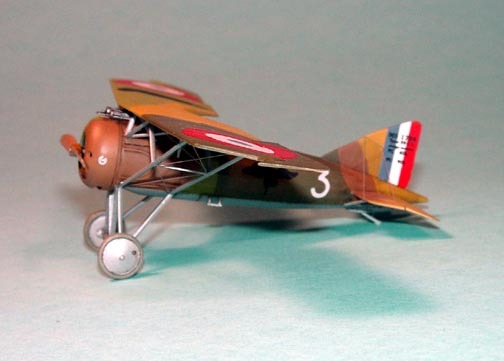 The seat was painted a leather color, and the belts – which came from the Tom Modelworks French set – were painted a grayish-clear doped linen color. Before gluing the fuselage halves together, I cut the rudder off the one-piece rudder/fin – which is attached to one fuselage side. 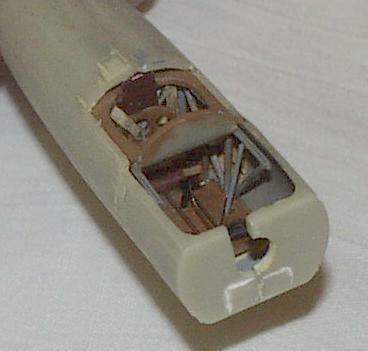 Once that was cut off and cleaned up, then the cockpit was glued into one fuselage side, and the fuselage halves were glued together. There is very little seam to clean up, and this area is better than most injected molded kits I have built. Another shining example of the excellent qualities of this model. Once the seam was cleaned up – with just a light sanding – I started to work on the cockpit enclosure piece. This required some dry fit and sanding to get to fit correctly – which included gluing the upper, cockpit tubular structure direct to the cockpit sidewalls. After cutting the control surfaces from the horizontal tailpieces, I glued the fixed stabilizers to the fuselage, and started to prep for painting. Using the kit instructions as guidelines – photocopied and cut out – I started to paint. After spraying the underside aluminum, I masked it off and sprayed the uppers beige (actually Polly Scale’s British Middlestone). 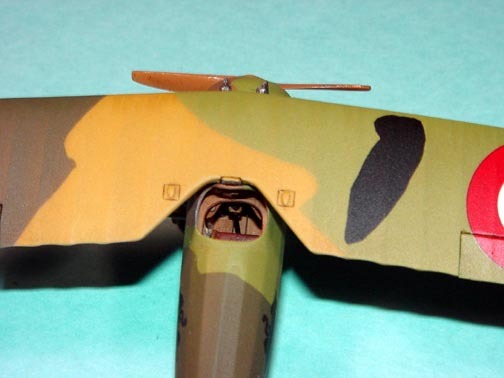 (Although the instructions say to paint the undersides “yellow”, according to the Mini-Datafile there is official documentation that states the undersides were finished in aluminum.) After the beige dried a couple of days, then the rest of the colors were sprayed on, starting with the light green (Polly Scale’s Germ. RLM 68 Lt. Ol. Gr. ), followed by the dark green (Polly Scale’s Fr. Fok. Dark Green) and the dark brown. (Unfortunately I sprayed on the wrong brown on the model, but decided to keep it – since it’s pretty close. The Polly Scale color that is more accurate is Ger. RLM 61 Dk. Brn.) All colors were thinned not only with “thinner”, but also with Future. This meant a pretty decent gloss coat for decal adhesion. After waiting a couple of days for everything to dry, I added the decals. I wanted to model Sgt. 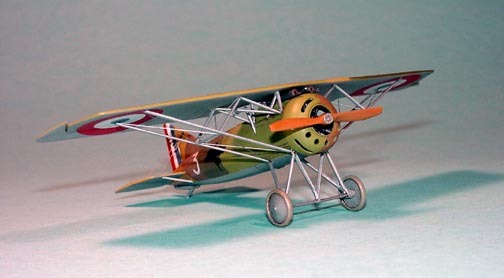 Schaffer’s machine, but I already glued on the upper, forward fuselage before realizing that Schaffer flew the MoS.27.C1 instead of the MoS.29.C1 the kit represents. So I went with Rand’s machine instead. The decals are excellent, in perfect register and snuggled down nicely. Now that the decals were on, and everything dry I started to add the wing. This is the only time I have used a jig to help with wing placement and alignment. Normally I make sure the lower wing is perfect, and use that as my guide when I add the upper wing. Since the MoS Type AI was a high-wing monoplane, I had no lower wing to guide from. After creating the jig from balsa and cardboard, I was able to get everything lined up correctly and started adding the multiple wing struts. Unfortunately the wing struts in my kit were completely unusable, so I substituted brass Strutz! for all wing struts. This was a little more of a pain than using Contrail plastic struts, but I wanted the strength the brass would give me. After gluing the longer, main struts to the wing and fuselage, I then removed the model from the jig, and added the rest of the struts. Quite time consuming since there is a large array of struts on the wing. Once the wing struts were in place – and dried for a few days – I then finished the model by rigging with .005” stainless steel wire, added the horizontal tail struts and finally the landing gear. I gave the model a “burnt sienna” oil wash and finished with an overcoat of PollyScale flat. The prop was painted and a coat of Future gloss was applied then the prop was glued to the engine. The kit is engineered in an excellent way to allow the prop and engine to spin together, so I just had to build the model with the moving parts. I normally glue everything solid – especially since most kits do not allow the prop and engine to turn simultaneously – but with this kit’s engineering, making the prop and engine spin was easy. This is the best WW1 kit I have ever built. With the inclusion of a complete cockpit (sans seat belts) as well as decals, it is also a complete kit. I can not recommend this kit highly enough. Buy plenty of them and convince Czechmaster to release more WW1 kits. If you’re listening, Czechmaster, we could do with the rest of the Morane-Saulnier’s, especially the Type AC and Type P.
My thanks to Czechmaster for supplying this superb kit.